A fault exposed in a paddy field due to the 2016 Kumamoto Earthquakes attracted much attention, calling for the necessity of its preservation (as a result, it is designated as a natural monument by Mashiki Town today). 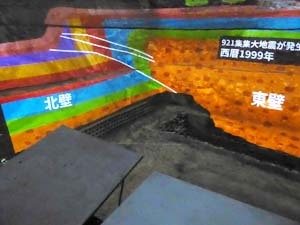 As a good example of disclosing and utilizing such preserved fault exposure, the Nojima Fault Preservation Museum (where the fault exposed due to the Hyogoken-Nanbu Earthquake, which triggered the Great Hanshin-Awaji Earthquake, is preserved) established in 1998 is well-known in Japan. In 1999, the Jiji Earthquake occurred in Taiwan. We visited a museum constructed following the Nojima Fault Preservation Museum with further development near Taichung, the damage of which was specifically serious. 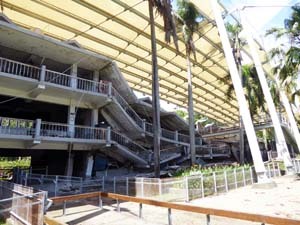 The 921 Earthquake Museum of Taiwan works well as a disaster prevention museum, which shows earthquakes with a focus on the effectiveness of quake resistance and quake-freeness by conserving a damaged junior high school building with a shelter constructed as the exterior walls of the museum for disclosure. 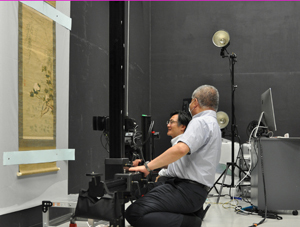 On the other hand, the Chelungpu Fault Preservation Park is a scientific museum, where an exposed fault section confirmed during the survey is directly exhibited inside the housing. The museum also shows the mechanism of an earthquake and the history of past quakes. Particularly, by means of project mapping focusing on the fault surface, they visually show the history of complicated strata in sequence, which is difficult to understand from the current plane of stratification. 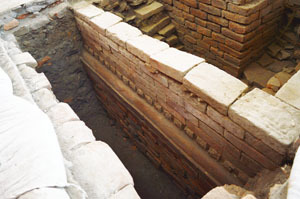 Application of such an approach is expected in various fields also in Japan, including explanations about remains at archeological sites besides the exhibition of the strata. Under the above-mentioned project commissioned by the Agency for Cultural Affairs, we continually dispatched personnel to Nepal. This time (from May 29 through June 27), fourteen members visited there, including outside experts and additional assistants budgeted separately. 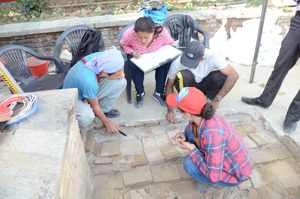 In the Nepal, we mainly conducted an excavation survey around Shiva Temple in Hanumandhoka Palace in Kathmandu (reported in the following title), a measurement survey and photographic recording for buildings around Aganchen Temple in the Palace, a boring survey to confirm the ground composition and soil bearing capacity around the two temples, and a strength test of brick wall specimens together with technical officials from UNESCO. 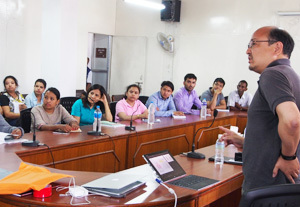 In addition, we reported the outcomes of the surveys conducted last year to about 20 technical staff members from the Department of Archaeology in Nepal and UNESCO Office in Kathmandu, and presented our project report to the Director General of the Department. We also organized a cooperation conference with administrative officials with jurisdiction over heritage settlements in the Kathmandu Valley so as to discuss the preservation of such historic settlements in the future and the operation of the conference while distributing reports of the Kick-off meeting held last November to the persons concerned. For your reference, the above reports (Japanese and English versions) are uploaded to our website. Please access the URLs below. The Japan Center for International Cooperation in Conservation conducted a field survey from June 12 to 24, 2017. During this survey visit, we also held meetings with Turkish parties concerned in preparation for the “Training course on the first-aid of mural paintings” to be held in the Republic of Turkey in the fall of 2017 or later. The main purposes of this past survey visit were to further improve our understandings of the current state of mural conservation in Turkey and also to determine the sites suitable for the hands-on session that will be a part of the training course. 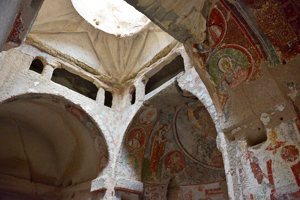 The mural paintings at about 15 locations, including churches in Trabzon on the Black Sea coast and cave churches scattered around the Göreme district in Cappadocia, were surveyed and valuable information was acquired to enrich contents of the training course. 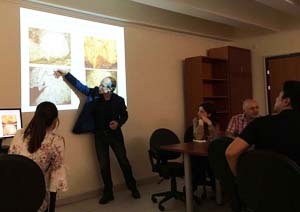 During our visit to the Department of Conservation and Restoration of Cultural Properties, Faculty of Fine Arts, Gazi University, and the Regional Laboratory for Conservation and Restoration in Nevşehir that have provided continuous cooperation in advancing the project forward since last fiscal year, presentations on case examples of the conservation and restoration of murals in Turkey were given and we had meaningful opportunities to exchange views regarding the topics of the program with lecturers who will engaged in the training course. 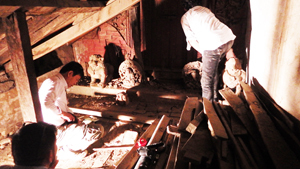 The first training course is scheduled to be held in October for Turkish specialists who are engaged in conservation of the cultural properties. We will proceed with the preparation of the training course so that it will become a good opportunity to consider and realize further improvement of protecting cultural properties from a new perspective.